Inspired by the lovely paper “Shock Waves in Weakly Compressed Granular Media” by van den Wildenberg, Rogier van Loo, and Martin van Hecke we investigate granular optics in the non-shock regime. We experimentally probe wave propagation in compressed granular media. Due to the presence of a Hertzian contact potential between particles, granular media is unique in that small changes in confining pressure translate into large changes in the sounds speed. We use this property to externally construct gradients in the effective refractive index. This allows us to demonstrate refraction within a granular pack. We further use this property to build acoustic lenses within a granular system using nothing more than applied confining pressure. We measure the propagation of sound waves within the granular material using force sensitive resistors. 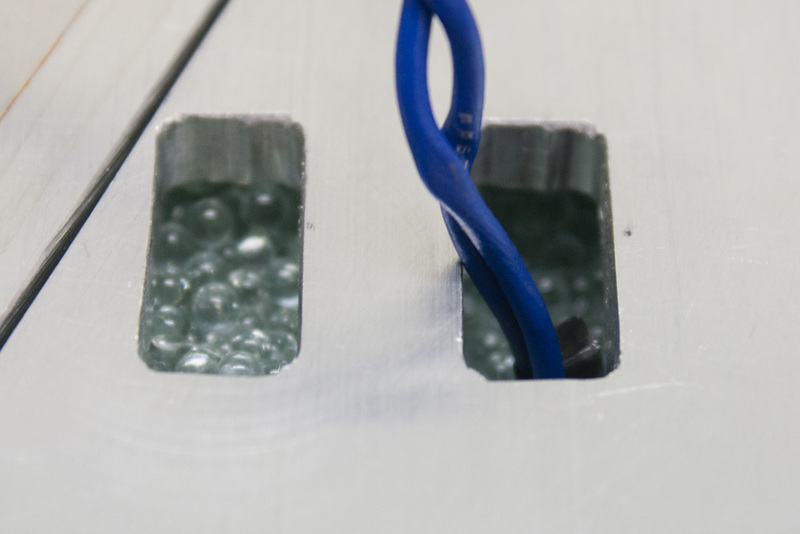 Our setup includes a 2’x2’x6” containment device (sandbox) and a variety of medium from mm glass beads (sand) to ½” stone material (rocks & gravel). By using a variety of granular medium we can further probe the refractive nature of the system. We apply steady confining pressure though metal plates.